Today the Pens won 3-0 over Tampa Bay in the Sunshine State. I felt cheated that Steven Stamkos wasn’t in the game. You will recall, he fractured his femur in a game in Boston requiring placement of a rod to stabilize the fracture. I bleed Black and Vegas Gold but a win in a game when the opposing team is without one of the greatest scorers in the league is slightly tainted. The first period saw Chris Kunitz went top shelf past net minder Bishop with assists from 87 and 58. That period also saw Geno go to the box for a fashion violation. Malkin was caught with his jersey tucked into his pants in the back. I for one am glad the NHL has stepped up to try to take control of the yet to be hazardous jersey tuck. During the second period there was some skating and some shooting. The third period was when Brandon Sutter scored a PP goal from behind the net when the puck. ricocheted off Bishop’s skate. Crosby and Jokinen with the assists. 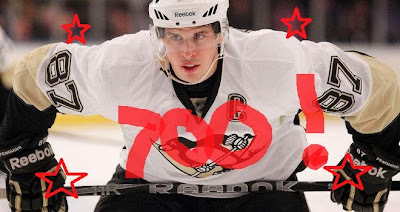 BTW, that assist was Sid’s 700th career point. This despite all the time he missed after his concussion that unfortunate puck incident. (The fastest to 700 pts among active players =Mind boggled) With less than 2 min to go in the 3rd, Kunitz was assisted to an empty net goal by 71 and 87. This game also marked Bylsma’s 100th road win as well as Marc Andre Fleury’s 26th career shutout. Fleury looked like he shook off any ill effects of having been pulled in the Toronto game. He is, after all, older and wiser now. If you played PENGO (see pre-game post) You crossed off 71, 87, 14, 16, 36, 58. 18 and 27 also went to the sin bin so cross them off. No one went PENGO but it was fun.